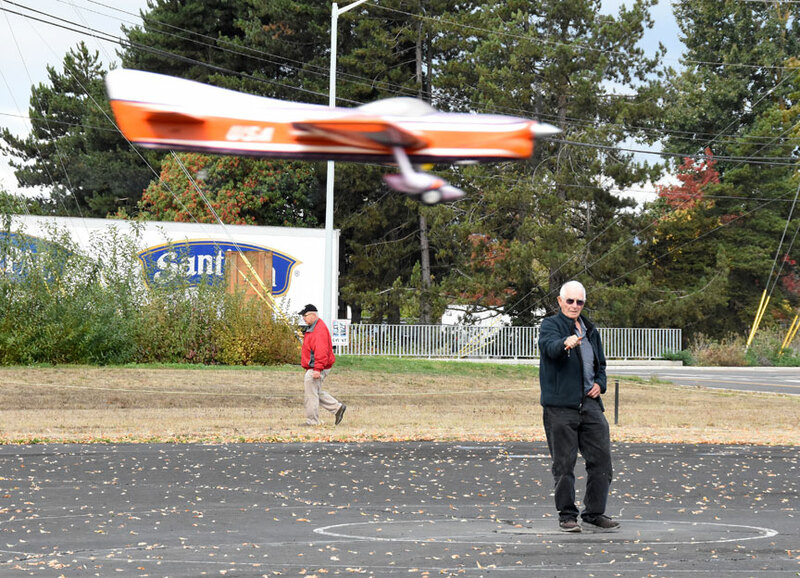 Walter Hicks' Giles 202 comes straight at the camera during a flight in Advanced Precision Aerobatics at the 2018 Fall Follies. Flying Lines photo. 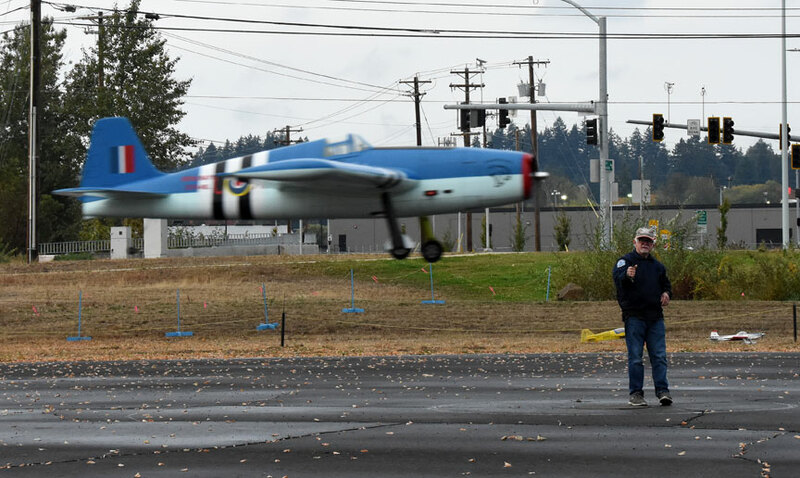 Oct. 6-7, 2018, Bill Riegel Model Airpark, Salem, Ore. 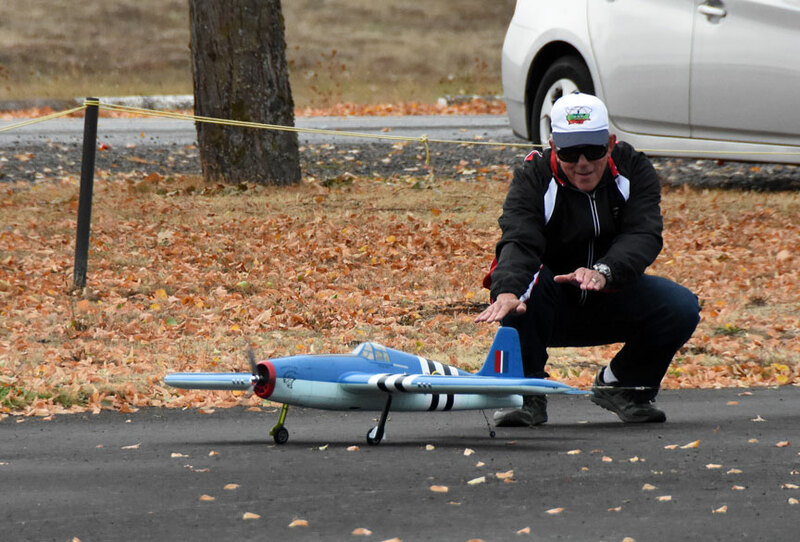 Cool, misty mornings gave way to breaks of sunshine and the occasional sprinkle at the 32nd Fall Follies, but flying conditions were good all weekend, particularly on Sunday, when just the lightest breezes made for some great flying and some high scores in aerobatics. It was occasionally breezy on Saturday, but every scheduled flight took place. 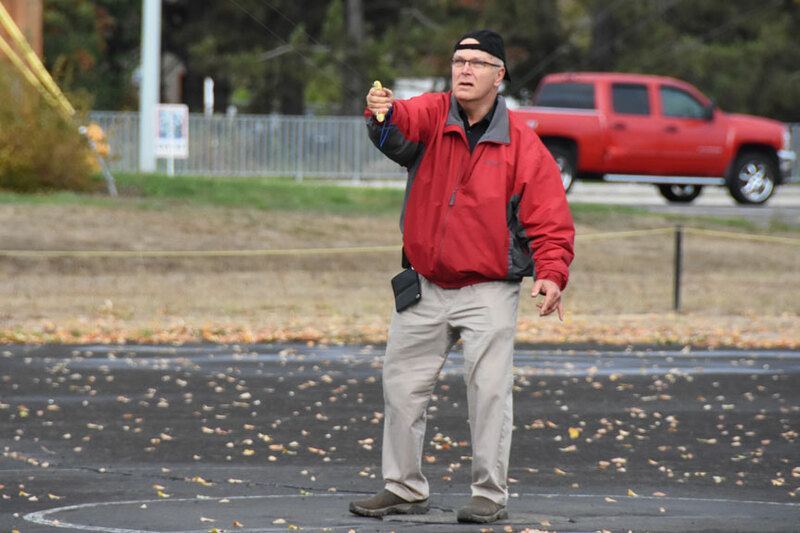 Turnout was light for the Saturday aerobatics events, but there was competition in every class. Five entrants battled it out in Northwest Sport Race in a series of fast preliminary heats and a two-up final. Chris Cox emerged from a tightly fought battle as the winner in Expert Precision Aerobatics, edging Paul Walker by 1.5 points and Howard Rush by 2 points. Dave Royer was the Advanced PA winner and he also topped Old-Time Stunt on Saturday. Mike Haverly won Classic Stunt; Jerry Eichten topped Expert Profile Stunt and Dane Covey won the Sportsman Profile event. John Thompson was the Northwest Sport Race winner. 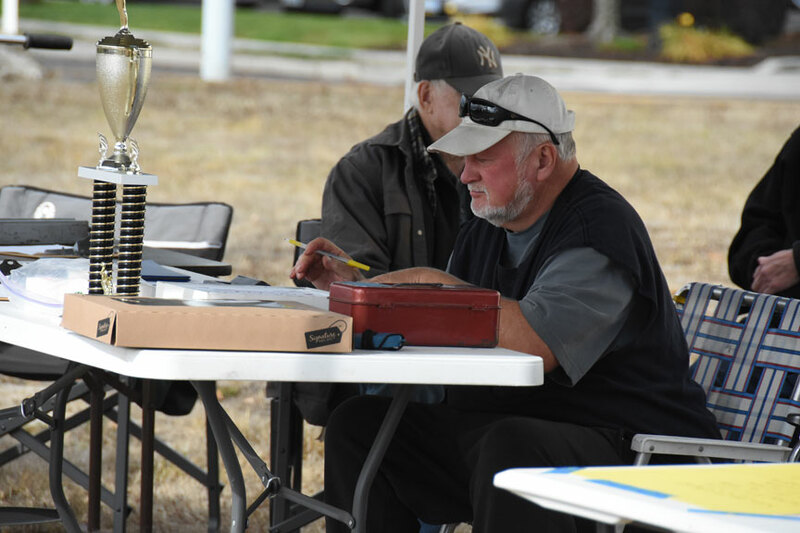 The Follies is the contest at which the annual Don McClave Vintage Stunt trophy is awarded to the top scorer in the Flying Lines Northwest standings in combined Old-Time and Classic Stunt. The 2018 champion was Dave Royer, who competed strongly in both categories; Dave also won the title in 2015. 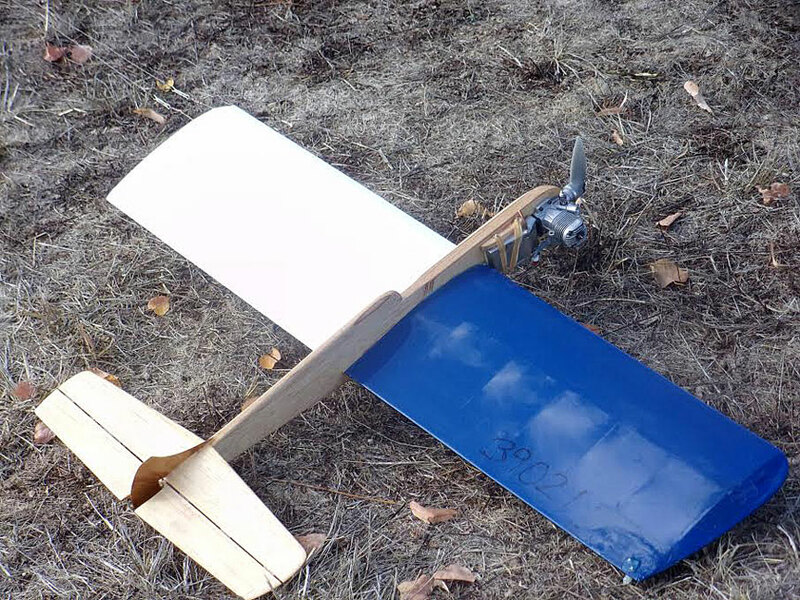 Dave flew his Humongous in Old-Time Stunt and his Warrior in Classic. Previous winners have been Bruce Hunt (2006, 2008, 2009, 2010), Scott Riese (2005), Pat Johnston (2007) and Pete Peterson (2011, 2013), Alan Resinger and John Thompson (2012, tie), John Thompson (2014) and Dave Royer (2015), and Mike Haverly (2016, 2017). The trophy is sponsored by Flying Lines. Mike Haverly puts in the winning flight in Classic Stunt with his Chizler. Flying Lines photo. Dave Royer heads for the handle to put in the winning flight in Old-Time Stunt. Royer captured the season's Don McClave Vintage Stunt Champion trophy for his performance all year long in combined Old-Time and Classic Stunt. Flying Lines photo. Dane Covey's Nobler glides to a landing in Classic Stunt. Flying Lines photo. Paul Walker launches Chris Cox's Hellcat for what turned out to be the winning flight in Expert Precision Aerobatics. Flying Lines photo. Chris Cox at the handle in championship form. Flying Lines photo. 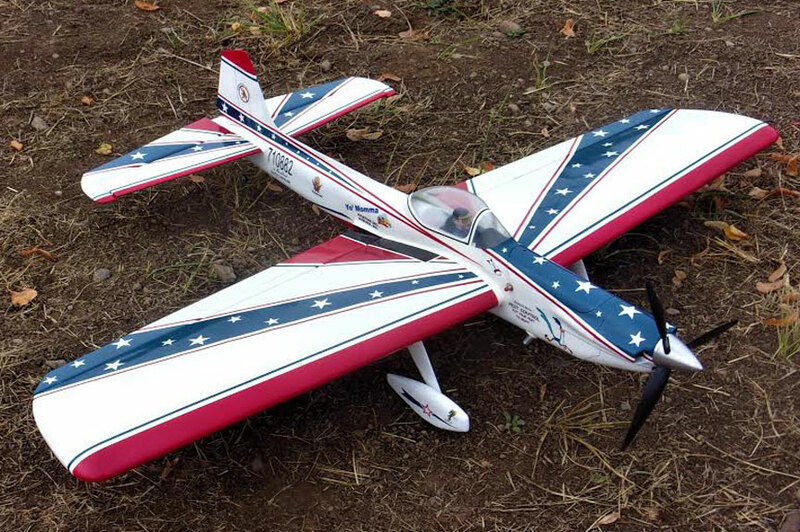 Paul Walker's Predator glides in for a landing in Expert Precision Aerobatics. Flying Lines photo. Expert Precision Aerobatics judges Walter Hicks (left) and Dave Royer record scores. Flying Lines photo. Dane Coveuy concentrates on a maneuver in Classic Stunt. Flying Lines photo. 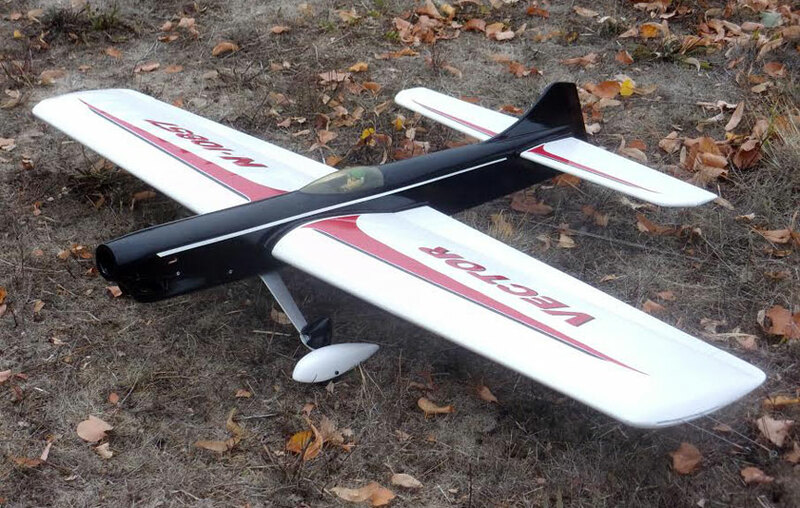 Walter Hicks' transparent Giles 202 looks unique in the air during an Advanced Precision Aerobatics flight. Flying Lines photo. 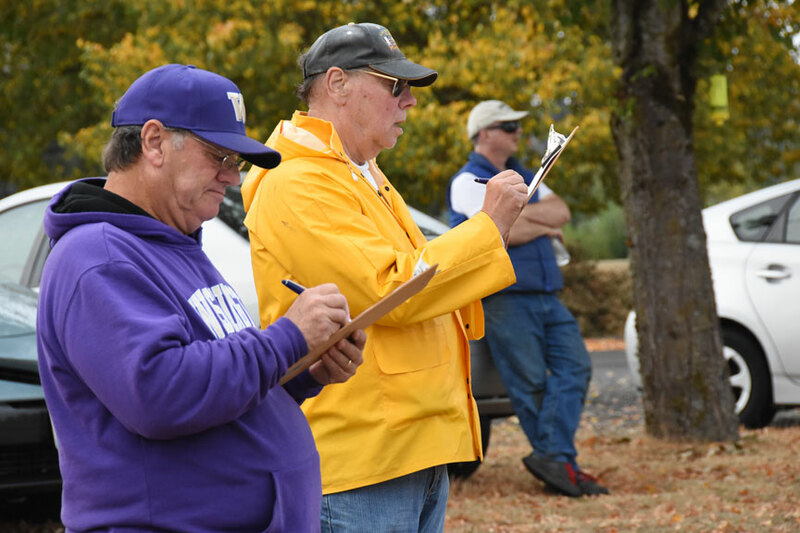 Do-everything Contest Director Mike Hazel tabulates Stunt scores on Saturday ... Flying Lines photo. 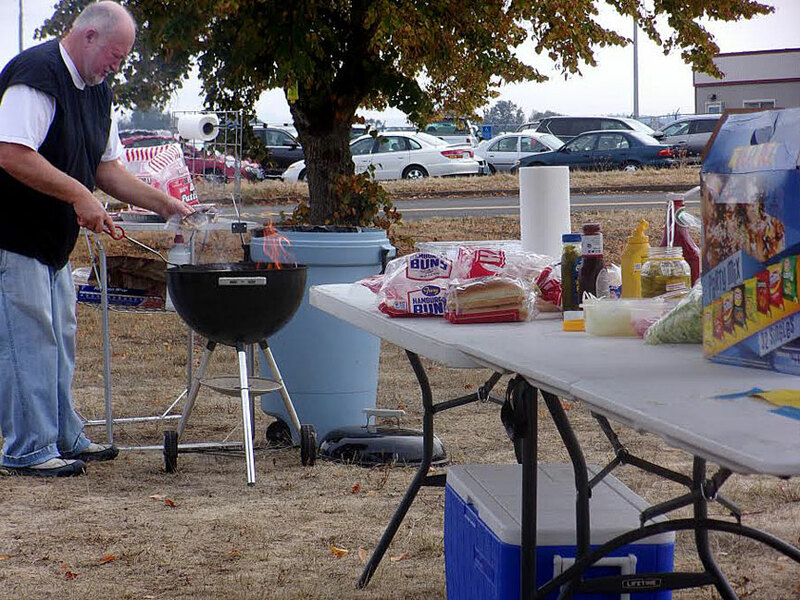 ... and cooks burgers at the Sunday barbecue. Steve Lindstedt photo. 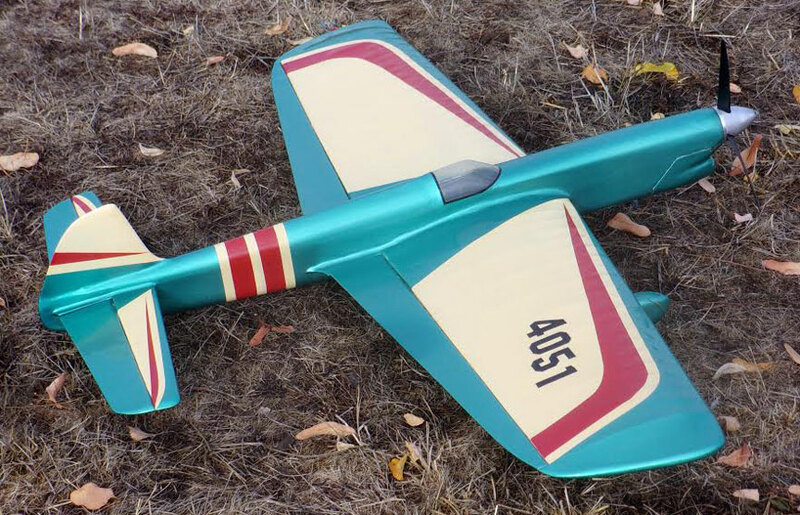 Dave Royer's Humongous glides to a landing in another Old-Time Stunt win. Flying Lines photo. 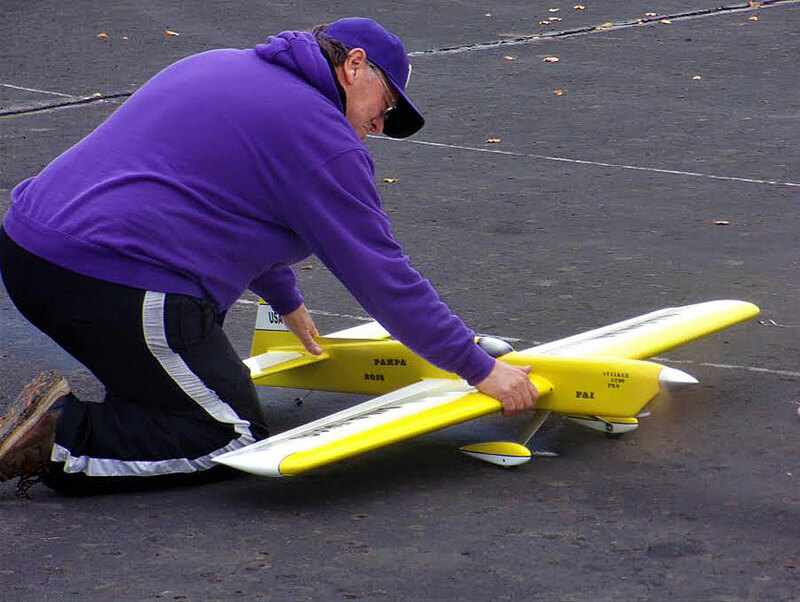 Walter Hicks prepares to launch Dave Royer's Magnum Plus for an Advanced Precision Aerobatics flight. Steve Linstedt photo. John Leidle's Olympus flew to second place in Classic Stunt. Steve Lindstedt photo. 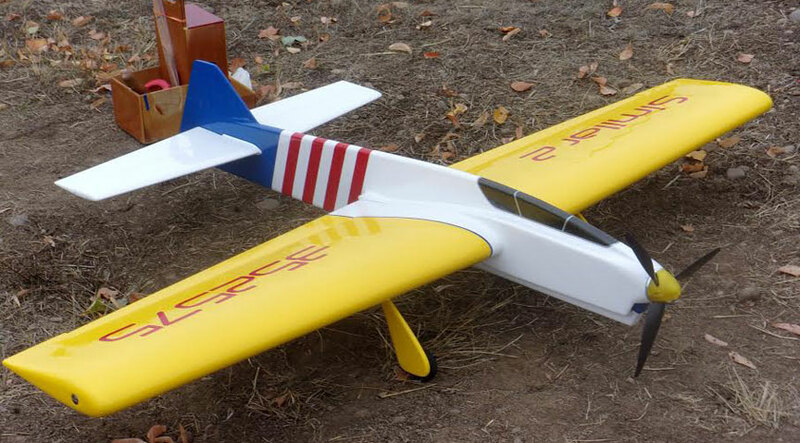 Mike Haverly's electric Chipmunk was flown in Expert Precision Aerobatics. Steve Lindstedt photo. A Vector 40 built by Tom Kopriva was donated by Gerald Schamp as a raffle prize. 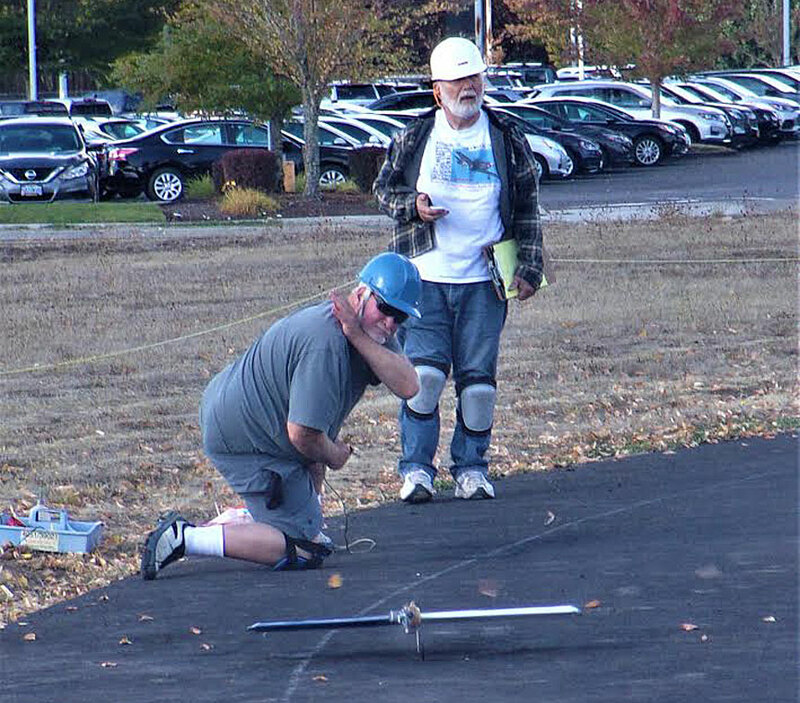 It raised money for the Western Oregon Control-Line Flyers' asphalt circle repair project, and Dave Royer had the winning ticket. Steve Linstedt photo. 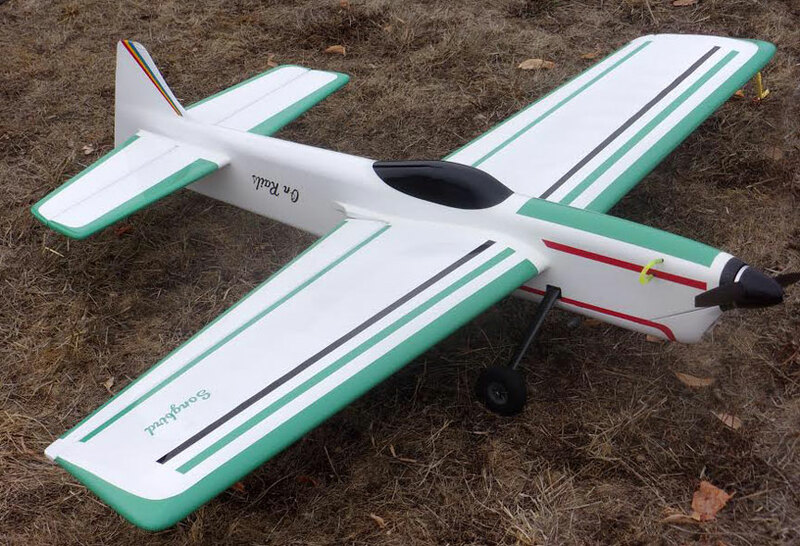 Fred Underwood's electric Similar Too, flown in Expert Precision Aerobatics. Steve Lindstedt photo. 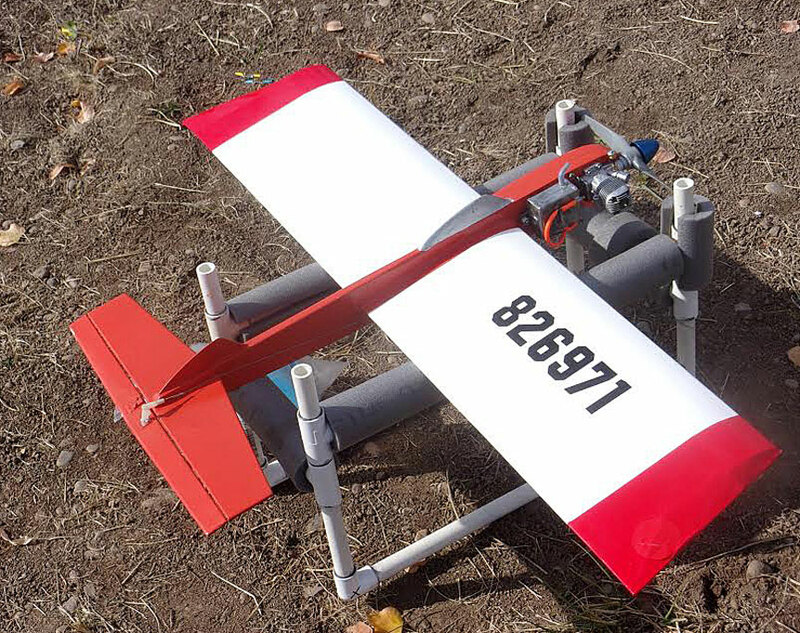 John Leidle's Songbird, powered by a growling PA .65, flown in Expert Precision Aerobatics. Steve Lindstedt photo. Howard Rush's electric Impact, flown in Expert Precision Aerobatics. Steve Lindstedt photo. John Thompson's Ares returned to action in Classic Stunt after several years of "retirement." Power is a Brodak .40. Steve Linstedt photo. 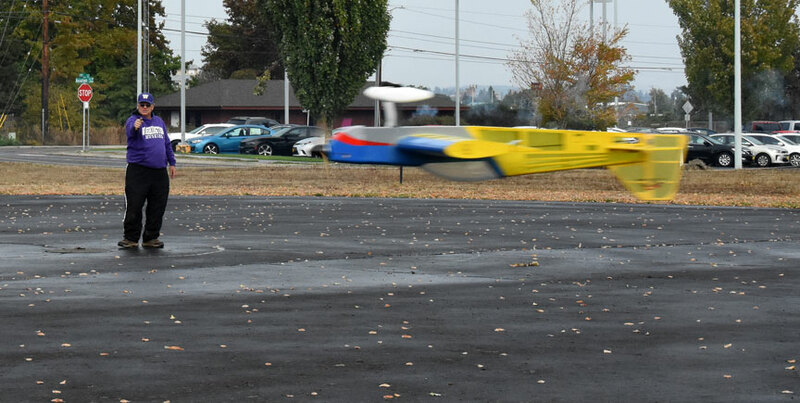 Gene Pape launches his ASP .25-powered Super Clown in a Northwest Sport Race preliminary heat. Steve Lindstedt photo. Doug Powers' O.S. .25LA-powered Super Fly Northwest Sport Race plane awaits action. Steve Lindstedt photo. Mike Hazel's Artesian, powered by an O.S. .25LA, awaits action in the Northwest Sport Race pits. Steve Lindstedt photo. 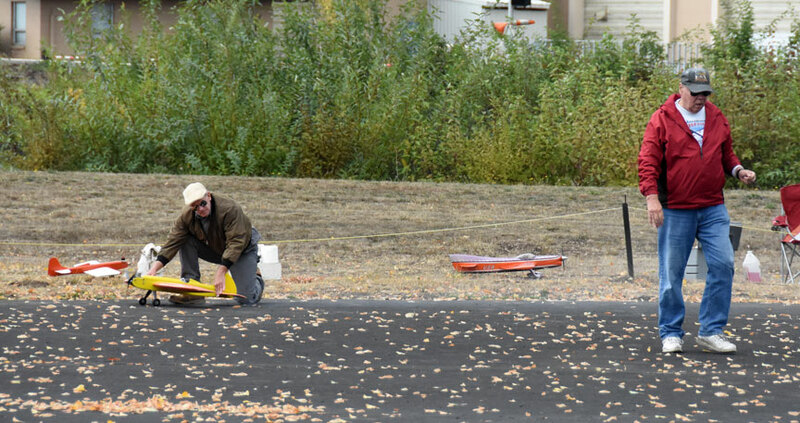 Mike Hazel launches his Northwest Sport Race plane in a preliminary heat. Steve Linstedt photo. 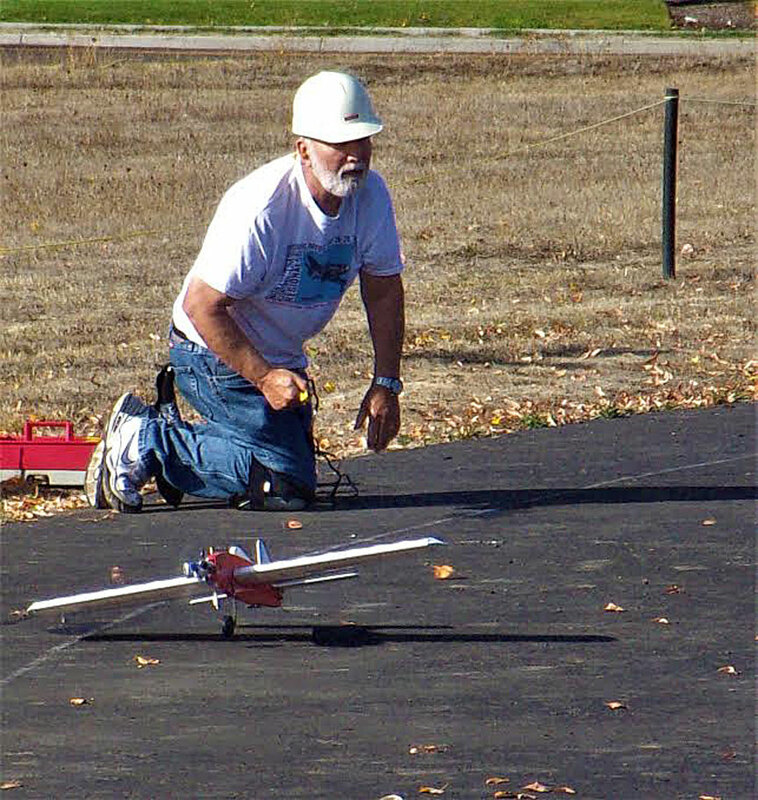 John Thompson refuels his ASP .25-powered Super Clown in the Northwest Sport Race final. Steve Lindstedt photo.